When you hear the word Singer, the brand, the image of sewing machines immediately comes to mind. That only goes to show how Singer has dominated the industry of sewing machines. It was the first to develop electric sewing machines which are the precursors of our modern machines today. 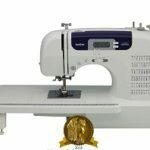 Most of Singer’s sewing machines that you will find in this website are for home use. They’re mostly compatible with light to medium-weight projects. 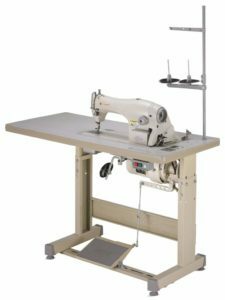 In this article, we’d like to highlight Singer industrial sewing machines. We will cover commercial-grade sewing machines designed for medium to heavyweight sewing. We will also include a serger. A serger machine specializes in a function that is not performed by mainstream sewing machines. You won’t probably find an industrial sewing machine as low-priced as Singer 191D-30. It costs a little over $600 and boasts of ½ HP power and 4000 SPM speed. That’s five times more power and four times more speed than what most heavy-duty home sewing machines have. This Singer industrial sewing machine comes with only one stitch, and that is straight stitch. Some users may find that a deal breaker. Remember, however, that industrial sewing machines are built for power, speed, and durability. They’re not meant for elaborate stitching. It has a knee lifter, which you use to adjust presser foot pressure. This is a useful function especially when you have your hands full with thick layers of fabric. Singer’s 191D-30 has an automatic self-lubrication system, a reverse stitch lever, and a table-top bobbin winder. You’ll find dials for adjusting stitch length and presser foot pressure easily. The tabletop measures 50”x22.5”. This gives you ample space for handling bulky fabrics with ease. 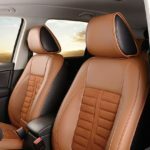 Sewing through leather and upholstery will be a breeze with the right feet and needles. Even light fabrics sewn in high volume will benefit from a tough machine like this one. Comes completely assembled – Ready to Sew! We consider Quantum Stylist 9960 as one of Singer’s industrial sewing machines in terms of the array of functions that it can do. 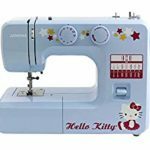 It has 600 built-in stitches, which includes 13 fully automatic buttonholers. This, plus countless special functions will allow you to produce fashion items in large scale. Thanks to its built-in automatic needle threader, starting your projects will be quick and simple. Automatic functions, like thread trimming, thread tensioning, auto-reverse, bobbin winder, and one-touch stitch selection make things so much easier. It has a top drop-in bobbin system with transparent cover. You can check thread supply every now and then without removing the lid. It means that there’s no more reason to run out of thread in mid seam. You can view and adjust the settings with its large LCD screen. If you’re doing some quilting or other huge projects, you can make use of a larger workspace by attaching the extension table. It sews at a top speed of 850 SPM. The best part about that, of course, is the speed control which you set with a few clicks. When considering a sewing machine for industrial use, one function that you might want the machine to have is the capability to do serging. Unfortunately, this is not a serger machine. But Singer 9960 does not disappoint with its seam finisher called the overcasting stitch. 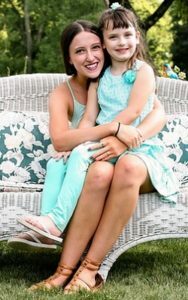 You may want to buy a side-cutting accessory to complete the serged look. It’s the perfect tool for the emerging designer or any passionate sewer! 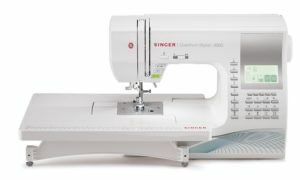 When it comes to serger machines, Singer has the exact thing. Singer’s ProFinish 14CG754 is a 2-3-4 thread serger. This description means that it is capable of serging with 2, 3, or 4 threads. It is the perfect choice for those who already have a reliable sewing machine but want that professional look in their finished products. 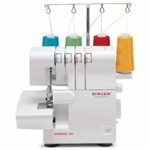 This serger has 6 built-in stitches, automatic fabric trimmer, and a speed of 1300 SPM. There’s no time wasted on sewing hems and raw edges with this serger. ProFinish has a removable free arm which comes handy when you’re working on cuffs, sleeves, and collars. You can adjust the tension and stitch dimensions with a simple turn of a knob. Everything’s made easy, so to speak. It lends your product a clean finished look while increasing durability by preventing fraying. For light industrial sewing, you may also want to consider other Singer heavy-duty machines. They’re not true industrial sewing machines, but they can handle high volumes of light to medium-weight projects very well. Singer HD4452 and Singer CG590 are examples of such machines. Both have motors that are 60% more powerful than ordinary home sewing machines. They are solidly built and versatile, too. On the other hand, the Singer industrial sewing machines that we’ve featured here are all made for serious sewing enthusiasts. If you exclusively sew heavy stuff such as canvas, upholstery, denim, tents, and carpets, then Singer 191D-30 will be right up your alley. You can pair this off with Singer 14CG754, and you’ve got your production line ready for some serious business. If you’re more into crafts and fashion, then Singer 9960 would be your best bet. Next Post:Upholstery Sewing Machine – Our Guide to picking the Best!